China’s pilot carbon trading markets will likely serve as the basis for a planned national emissions trading system that will become by far the largest in the world. But these experiments have experienced challenges, including ensuring that regulated companies actually comply with the regulations, and key lessons learned from their operation to date should be applied to ensure a national program successfully addresses China’s rising carbon problem. 22 October, 2014 | About 30,000 runners competed in the 26-mile Beijing Marathon in China this week. But a dark cloud hung over what should have been a joyous event, literally, as in the thick smog that forced many participants to race with masks over their mouths. Beijing and six other jurisdictions launched pilot carbon trading systems within the last 18 months to address the pollution problem that has plagued the country. The city of Qingdao is set to join the mix in 2015 after recently approving plans to start its own carbon market in preparation for the expected implementation of a national market in 2016. China’s pilot programs combined already constitute the second largest carbon market after the granddaddy of trading schemes the European Union’s Emissions Trading System (EU ETS), according to a World Bank analysis. However, the anticipated national carbon market in China would regulate 40% of the country’s economy, making it by far the largest in the world, by covering roughly 3-4 billion tonnes of carbon dioxide up to 2020 and worth up to $65 billion if fully implemented. The stakes are high because a successful national program in China, which is now responsible for a third of global greenhouse gas emissions, could trigger more widespread adoption and possible linkage of national and subnational carbon markets across the globe. Given the stakes, experts are taking a hard look at how China’s pilot carbon markets have fared to date. And they are finding plenty of room for improvement. “This is still a work in progress a real experiment, Barbara Finamore, Senior Attorney and Asia Director, Natural Resources Defense Council (NRDC), said during a Climate Action Reserve webinar on Tuesday. “Of course (China is) the big kahuna. If China is able to succeed it will set a standard that others will follow. Resources for the Future (RFF) just examined the three longest-running pilot cap-and-trade programs likely to serve as models for a national program in China: Guangdong, Shanghai, and Shenzhen. “The pilots in Guangdong, Shanghai and Shenzhen have made significant progress in building a cap-and-trade market, RFF stated in a paper called Assessing the Design of Three Pilot Programs for Carbon Trading in China. “Some aspects of pilot designs represent a deft tailoring of a fundamentally market-based instrument to a socialist market economy. Yet potential design deficiencies remain. Allowance prices in the three programs are relatively stable, with Guangdong generally having the highest carbon price of around ¥60 or US$10 per tonne of carbon dioxide equivalent (tCO2e). Volumes of traded allowances remained very low until right before compliance deadlines and the total number of traded allowances constitutes a small fraction of the total number of available allowances. For example, the most active market Shenzhen traded a total of 1.6 million allowances throughout its first compliance year, equal to nearly 4% of the total allowances available in the market, which indicates a very low liquidity market, the RFF paper noted. Two of the three pilots, Shanghai and Shenzhen, met their compliance deadline of June 30, 2014, with Shanghai achieving 100% compliance and four out of 635 industrial firms in Shenzhen failing to comply on schedule. Local governments, however, had to go through significant effort to ensure full compliance with the programs, sometimes at the expense of their environmental integrity, the RFF authors noted. Regulators in Shanghai, for example, unexpectedly held a one-off auction to introduce additional allowances into the market on June 30. Companies purchased 7,200 allowances at this auction, meaning the effective cap likely rose by the same amount, which potentially increased overall emissions and weakened the environmental integrity of the Shanghai pilot, said Clayton Munnings, RFF Research Associate and co-author of the paper. It’s unclear if this occurred because Shanghai has yet to publish official estimates for the overall cap. Guangdong postponed the first compliance deadline by nearly a month, with two out of 184 firms ultimately failing to comply by the later deadline. Regulators also conducted a fifth and unplanned auction on June 25 with nearly two million allowances. “The challenges we’re seeing with the pilots will certainly be exacerbated once we move to a national system, NRDC’s Finamore said. Strengthening the legal and administrative foundations was at the top of the list of recommendations RFF made on solidifying the carbon trading pilots. It’s a concern shared by Finamore, who noted that 25% of covered entities in Beijing’s program were still refusing to participate near the end of the first compliance period. It wasn’t until the local government started cracking down inspections and talking about fines potentially three to five times the average market price for each tonne of carbon dioxide exceeded that there was a last-minute rush to obtain permits, which drove up prices in July to nearly $12/tCO2e. “There is a lack of a strong legal foundation for carbon trading in China, she said. “There isn’t anything in the law or even in the plan that requires companies to participate. To ensure compliance, RFF suggested that lawmakers state in a national environmental law that regulated firms should be fined on a per tonne instead of per violation basis, with the fine being equal to a multiple of the average market price of allowances for each tonne of excess emissions. This national environmental law should also explicitly mention that such penalties apply to cap-and-trade systems for carbon. RFF also proposed incorporating achievement of emission reduction goals to the individual performance reviews of participating government officials and executives of state-owned entities (SOEs). 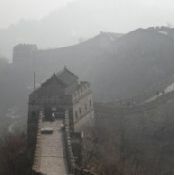 Tying the achievement of environmental goals to the possibility of promotion and demotion helped China achieve its sulfur dioxide reduction goals in the late 2000s, the authors noted. Coverage of these SOEs will be an important issue in moving toward a national program, Munnings said. A small number of SOEs constitute a majority of carbon emissions coming from the electricity sector and a national program would likely need to cover these SOEs from the electricity sector to control carbon emissions, he said. This makes fining on a per-tonne basis and tying achievement of goals established by a cap-and-trade program to performance reviews of SOE executives particularly applicable, Munnings said. Increasing transparency of the cap by publicizing business-as-usual emissions and the emissions impact of complementary policies is also on RFF’s list of recommendations. Transparency about emissions levels remains a critical issue in the pilots, including in Beijing even though the world’s eyes are on the city due to its air pollution problem, Finamore observed. Beijing highlighted a 4.5% drop in GHG emissions in 2013, but did not identify the baseline for the reduction or how many permits were issued in the program, she said. “It’s very difficult to get a clear picture from any of these pilots about what’s going on, Finamore said. China’s pilots have not yet linked to allow trading between the programs, but Guangdong may consider interprovincial trading with Hubei and other provinces, with regulators calling for further research on linking and setting a goal of designing an interprovincial market before 2020. However, the RFF authors recommended regulators attempt to identify the sources of low levels of liquidity before trying to increase trading activity and noted that such links may not be established if a national program starts in 2016. Shenzhen which is part of Guangdong Province, but has its own pilot trading program because of its independent, sub-provincial division status has experimented with innovations designed to attract foreign investors such as allowing trades to be settled in foreign currency, Finamore said. “They would love to link to the international carbon markets as soon as possible, he said. The local governments largely set the rules and oversee the pilot carbon markets, with the exception of the offsets component, which is administered by China’s National Development and Reform Commission (NDRC). Offsets for China’s pilots are known as China Certified Emissions Reductions (CCER) a reflection of the fact that the approval process closely resembles the United Nations’ Clean Development Mechanism (CDM) Certified Emission Reduction (CER) program. The NDRC plays the role of the CDM Executive Board in overseeing the development of project methodologies and registrations and hosting a national registry. The NDRC has already announced it will allow 14 projects to generate six million offsets that could be sold into the pilot markets. Offsets generated in China’s pilot trading programs have a unique advantage over allowances issued during the pilot phase because the offsets are being developed under regulatory guidelines by the NDRC and are therefore likely to be carried over into any national scheme that emerges. Offsets can generally be used for compliance in the pilot programs for up to 5-10% of obligations, but there are restrictions. Companies in Guangdong cannot use CCERs to comply with more than 10% of their annual emissions, and 70% of the CCERs used must originate in the province. Producers of HFC-23 offsets banned from the EU ETS because of perverse incentives that encouraged their production remain eager for new buyers and are hoping the NDRC will approve and issue CCERs for their projects, Munnings said. “Even though all pilots do contain provisions that allow for limited use of offsets, I remain slightly skeptical that many offsets will be used in the pilots at least in the near future, he said. “First, I think the NDRC will act very cautiously to only approve and issue offsets with high environmental integrity, which would limit the overall supply of offsets. Second, even if a healthy supply of offsets emerges, I think pilot regulators might act to further discourage regulated firms from purchasing offsets in order to ensure price discovery in the allowance markets.